The Allan family raised this small, luxury hotel to international fame in the 1990s, gaining a Michelin star and accreditation through the Relais & Chateaux collection. When the Allan’s sold up, another family took over the reins. Current owners Shaun and Jenny McKivragan have continued the good work, with the restaurant retaining three AA rosettes and gaining a Hotel Chef of the Year award for Chris Stanley in the kitchen. There has also been substantial recent investment in the rooms at Airds. Always luxurious and well appointed, the rooms have been undergoing a programme of refurbishment and upgrading to bring some 21st century chic, with lime-stoned ‘spa’ bathrooms, flat-screen TVs, wi-fi, et al. There’s also a brand new suite with its own little courtyard. Perhaps the nicest thing about Airds is the attention to detail and almost spooky ability of the staff to be invisible right up until the second you need something. Over serveral visits I have yet to see a maid making up a room, or vacuuming a hall or plumping cushions in one of the sitting rooms, but somehow, almost miraculously, these things are always perfectly done. 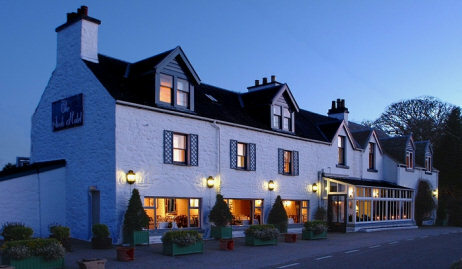 The hotel lies 19 miles north of Oban on Scotland’s west coast, down a winding single track road to the Port of Appin. It is an old white-washed building, originally a ferry inn, with its own gardens that run right down to the shores of the ruggedly beautiful Loch Linnhe. Spectacular views are on offer from the dining room and from some of the upper floor rooms and suites, picking out a little lighthouse and the slate-blue Morven hills beyond. The picture-postcard setting and simple whitewashed exterior belie the luxury within. Public rooms are traditional with plump sofas, books, games, the tick of grandfather clocks and a multitude of cosy corners to take tea or sip an after-dinner malt. The setting is one of the most beautiful in Scotland, and a short walk round the coast brings you to the village shop, another very good seafood restaurant and the little ferry over to the historic Isle of Lismore, a popular day trip for many visitors to Airds. Back at the hotel, summer afternoon tea taken in the garden looking over the loch is magical, but then winter brings a crackling log fire and sumptuously over-stuffed sofas indoors. It’s a tough call on which is more enjoyable. The restaurant at Airds really is excellent, with an innate understanding of balance and classical techniques, married to definite flavours and emphasis on the finest Scottish ingredients. My starter of seared breast of squab pigeon in a pastry shell, doused in wild mushrooms and with a lobe of seared foie-gras on top, was typical of two dinners studded with highlights. Baked halibut with a crab crust, came with a pungent but never over-powering herb mash. Desserts included a beautiful pistachio and chocolate soufflé, served with a jug of chocolate sauce to pour into the freshly cracked crust. The wine list is extensive, and coffee and petit-fours are taken back in the cosseting tranquility of one of the lounges. Airds is a very grown-up sort of place, and whilst the welcome could not be warmer or more charming, it has a hushed atmosphere that some might describe as rather formal. I’d disagree: formality is often a state of mind, and a weekend break at Airds is one of the most relaxing and restorative ways I can think of to blow the bank balance. 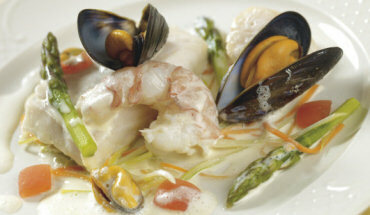 Room, dinner and (brilliant) breakfast for two starts around £260 per night off-season, closer to £350 in summer. The restaurant is open for lunch and dinner to non-residents too.